We know moving house is about more than just transporting furniture and boxes. Our services are designed to be the perfect solution when it comes to moving house. You may have already had to deal with estate agents, solicitors, mortgage companies and more. At Bryan Stevens Removals, we aim to take the rest of the headache out of your house move and make the transition to your new home as stress free as possible. We offer a package of affordable services covering all aspects of your home move. Our helpful staff will pack your belongings (if you have requested the service), load them onto our vans, deliver them to your new home and place them where you want them. We can even put you in touch with a cleaning company who will provide a full range of cleaning services, including full house cleaning to windows and carpets. 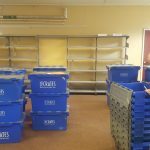 Bryan Stevens House Removals is based in the West Midlands, with offices in Coventry, Leamington and Rugby. 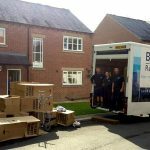 We regularly undertake house removals in Coventry, Leamingon, Rugby, Warwick, Kenilworth, Stratford, Nuneaton and Solihull. We also move people further afield and will travel all over the country. 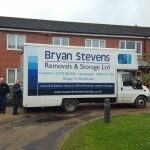 The team at Bryan Stevens Removals are happy to do smaller jobs and we regularly help with ‘part moves’. We provide a “Man with a Van” service to help pick up large items eg a new Freezer from the local electrical store or the new wardrobe snapped up on eBay. With over 23 years in the business, Bryan Stevens removals are very reliable and have full removal insurance. That means you can have peace of mind while they look after your move. But don’t take our word for it – read testimonials on our website or facebook page from happy customers who we have helped move. Bryan Stevens Removals gets an average of five out of five stars on our facebook page. We give free quotations so call us today for a price – you have nothing to lose!